Hi, I am interested in your 1956 Volkswagen Beetle (stock #MHM3173) listed on Autotrader for $19,900. I'd like to get more information about this vehicle and confirm its availability. 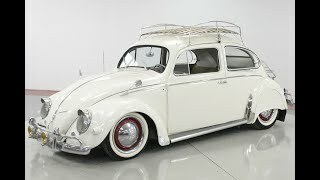 Worldwide Vintage Autos is pleased to present this 1956 Volkswagen Beetle. The Volkswagen Beetle officially the Volkswagen Type 1, informally in German the K fer (meaning beetle), in parts of the English-speaking world the Bug, and known by many other nicknames in other languages is a two-door, rear-engine economy car, intended for five occupants (later, beetles were only allowed for four people in some countries), that was manufactured and marketed by German automaker Volkswagen (VW) from 1938 until 2003.